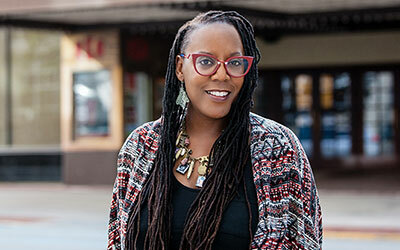 State Theatre New Jersey’s signature residency program features poet Glenis Redmond. The annual residency has taken her to over 130 sites throughout New Jersey—including schools, senior centers, libraries, residential treatment facilities, correctional institutions, corporate offices—and touched the lives of more than 16,000 people. 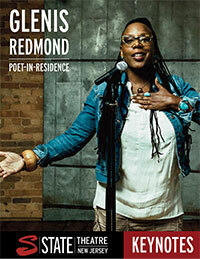 Glenis shares her deeply personal poetry in informances and performances for groups both large and small. 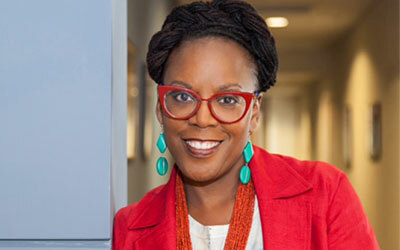 She also leads writing workshops that showcase her unique gift for teaching and inspiring others to write. 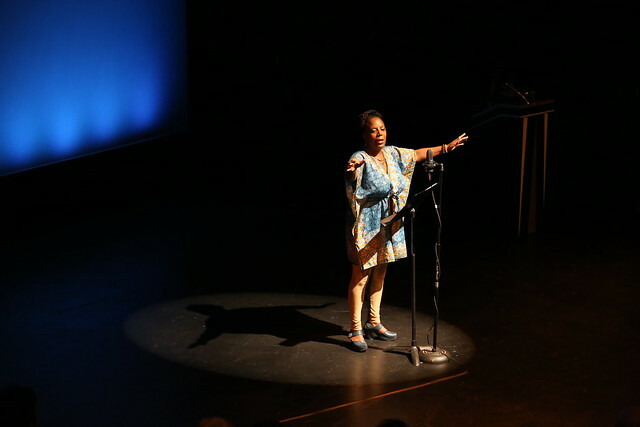 Each year’s residency culminates in a community reading where dozens of people share the poems they created in Glenis’ workshops. Most of State Theatre New Jersey’s residency programs are targeted to specific audiences and open by invitation only, though some events are open to the public. Workshops take place in the second floor lobby of State Theatre New Jersey. There is no elevator access to this space. 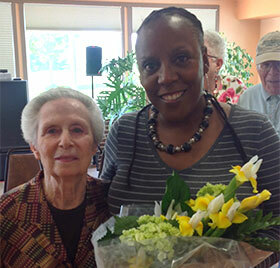 Glenis Redmond and Norma Heflin at an Informance at Quail Brook Senior Center in Somerset. 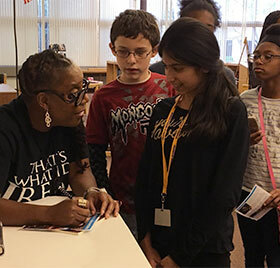 Glenis Redmond was a hit with students at Franklin Middle School in Somerset. Glenis has developed strong bonds throughout the community during her years working with State Theatre New Jersey. Her experiences and the people she has met have inspired a number of her poems, including the following piece, which is dedicated to Norma Heflin, who Glenis first met at Quail Brook Senior Center in Somerset in 2014. She’s got a knowing and glowing light. Everywhere she spins: a dance floor. able to see into the depths. gray is not an option. a ballerina never at rest. we both hear in our hearts. with the warmth of understanding. Listen to Glenis on our Weekly Radio Show All Access with State Theatre New Jersey!